Our original style hex bead teether's are each individually hand crafted to ensure the highest quality possible. Our design features two wooden rings for baby to easily grasp and gnaw on the teether. These teether's help tremendously with soothing a fussy baby. 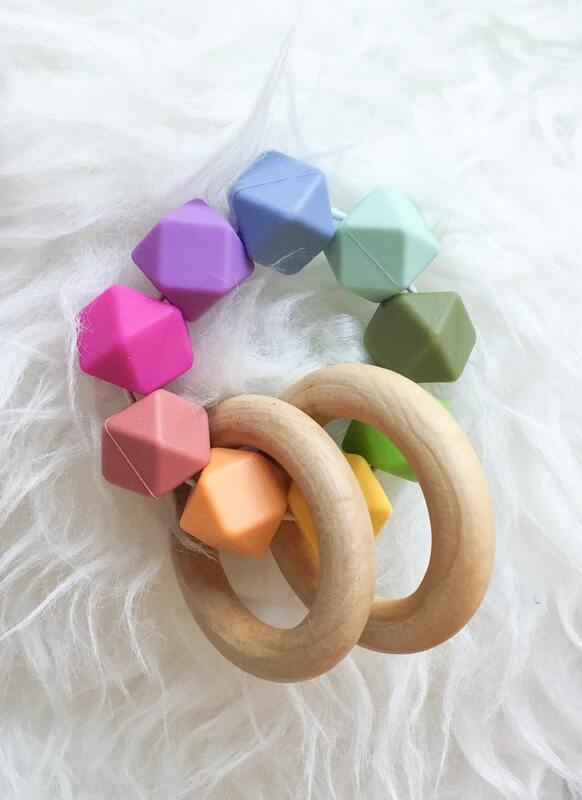 All beads are made with food grade, BPA-free, non-toxic beads and all natural wooden teething rings. All teether's are inspected for quality and given a "pull" test before their shipment. We recommend using warm water and a mild soap for cleaning. Never submerge the rings under water as they can warp. Another great way to clean the teether's is with baby-safe, food-grade sanitizing wipes! Every now and then, we substitute certain colors we're low on for like colors. For example, if we are out of red beads for our rainbow teethers we may substitute with our red coral instead as to not create a delay for your order. If you are not okay with this simply leave a note at checkout that you are not comfortable with any substitutions to prevent delays. Love our gorgeous teether so much. Our 4 month old loved it IMMEDIATELY! Preparing to buy a handful. Giving them to all our friends and family that just had babies. Was so excited to receive this today. It is adorable and of really impressive quality. I'm delighted to be able to give this as part of a baby gift this Christmas. These toys are perfect for little ones to chew on. The seller was prompt and communicated the process from purchase to receipt very well. Will definitely use this seller again. Thank you! My baby girl loves it! We love getting custom and personalized orders! Simply contact us and we will coordinate getting your custom order set up and made! How secure are your teething toys? Our toys have gone through a rigorous testing process. They have been pressure tested by a professional lab, as well as pressure tested in our shop with over 10 lbs of pressure. Each piece is handspring, secured, and pull tested before shipment. Even though we are confident in our toys and their strength, we still require that all toys be used under adult supervision. Are there any variations in the teethers? What makes your teethers different than others? While we pride ourselves on providing the highest quality possible, we are also proud to say we are the original makers and designers of this teether style. We call them our Double Ring Hex Bead Teethers. We have been hand making every one of our one of a kind teethers for going on three years.